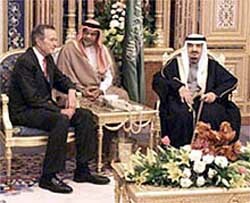 Prince Turki al-Faisal, Saudi intelligence minister until shortly before 9/11 (see August 31, 2001), will later claim that around this time its external intelligence agency tells the CIA that hijackers Nawaf Alhazmi and Khalid Almihdhar have been put on a Saudi terror watch list. The Saudis have been tracking the two men, as well as Nawaf’s brother Salem, for some time (see March 21, 1999, April 4, 1999, April 6, 1999, and After Early April 1999). Saeed Badeeb, Turki’s chief analyst, and Nawaf Obaid, a security consultant to the Saudi government, support Turki’s account though Turki himself will later back away from it after becoming Saudi ambassador to the US (see August 21, 2005). 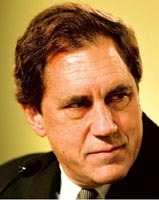 In 2003, Prince Turki will say, “What we told [the CIA] was these people were on our watch list from previous activities of al-Qaeda, in both the  embassy bombings and attempts to smuggle arms into the kingdom in 1997,” (see 1997 and October 4, 2001). However, the CIA strongly denies any such warning, although it begins following Almihdhar and Alhazmi around this time (see January 2-5, 2000 and January 5-8, 2000). [Associated Press, 10/16/2003; Salon, 10/18/2003; Wright, 2006, pp. 310-311, 448] The US will not put Almihdhar and Alhazmi on its watch list until August 2001 (see August 23, 2001). Masooud Al-Benin. [Source: Public domain]After the French put Zacarias Moussaoui on a watch list some time in 1999 (see 1999), they continue to discover more of his ties to militant groups. In late 1999, Moussaoui’s mother says a French intelligence officer contacts her and says her son’s name was in the address book of a man named Yannick who had died fighting for the Muslim cause in Bosnia. [Los Angeles Times, 12/13/2001] In April 2000, French investigators increase their interest in Moussaoui when they learn his best friend Masooud Al-Benin was killed while fighting in Chechnya. Investigators conclude al-Benin and Moussaoui traveled and fought together in Chechnya. Moussaoui’s mother is contacted by French authorities and asked about her son’s whereabouts and his connections to Al-Benin. [CNN, 12/11/2001] At some time in 2000, French intelligence follows Moussaoui to Pakistan. They believe he goes to see an al-Qaeda leader named Abu Jaffa. [CBS News, 5/8/2002] (Abu Jaffa, also known by the names Abu Jafar al-Jaziri and Omar Chaabani, is an Algerian in charge of al-Qaeda’s training camps in Afghanistan. It appears he will be killed in Afghanistan in late 2001.) [Knight Ridder, 1/9/2002] By 2001, French intelligence will be said to have a “thick file on Moussaoui.” [CBS News, 5/8/2002] When Moussaoui is arrested in the US, the French will send this information to Washington at the FBI’s request (see August 22, 2001 and August 30, 2001). 9/11 hijacker Khalid Almihdhar tells another operative that al-Qaeda is planning a ship-bombing attack. The US will learn this from a detainee interviewed in December 2001. The detainee will say that Almihdhar informed him that al-Qaeda operative Abd al-Rahim al-Nashiri was the plot’s originator. [9/11 Commission, 7/24/2004, pp. 491] Al-Nashiri discussed the ship bombing attack in a telephone call made in late 1998. The call may have been to the al-Qaeda communications hub at which Almihdhar lived and may also have been picked up by the US (see (Mid-August 1998)). 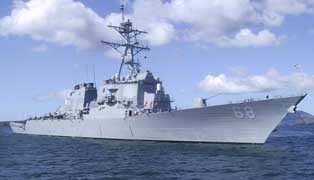 Al-Qaeda soon attempts to attack the USS The Sullivans in Aden, Yemen, but the plan fails (see January 3, 2000). Almihdhar, who will be accused of participating in the plot to bomb the USS Cole in Yemen (see October 12, 2000, Early October 2001 and October 4, 2001), travels to Yemen shortly before the attack on the Sullivans (see November/December 1999) and apparently leaves one day after it (see January 2-5, 2000). 9/11 hijacker Khalid Almihdhar returns from Afghanistan to Yemen, where he and his family live at an al-Qaeda communications hub that is being monitored by the US (see Late 1998-Early 2002). The NSA listens in on calls to his number and finds that he and several al-Qaeda leaders are to meet in Malaysia for a terrorism summit (see December 29, 1999). The reason for his departure to Yemen is unclear, as he has already been selected for the 9/11 operation and his fellow operatives are undergoing training in Afghanistan at this point (see Late 1999 and Early December 1999). Detainees give varying accounts of the reasons for his departure, as well as the exact timing. [9/11 Commission, 7/24/2004, pp. 157, 493] According to author James Bamford, Almihdhar returns to Yemen to be with his wife when he learns she is pregnant with their first child. [Bamford, 2008, pp. 11] Whatever the reason for Almihdhar’s travel to Yemen, while he is there al-Qaeda mounts an abortive attack against the USS The Sullivans (see January 3, 2000). The NSA has been monitoring a telephone in an al-Qaeda communications hub in Yemen (see Late August 1998 and Late 1998-Early 2002). According to Vanity Fair, “Amid the storm of pre-millennial ‘chatter,’ the [NSA] intercepted communications among three Arabic men, each of whom bore some connection to the East Africa bombings (see 10:35-10:39 a.m., August 7, 1998) and to al-Qaeda.” The men are hijackers Khalid Almihdhar, Nawaf Alhazmi, and Salem Alhazmi. [Vanity Fair, 11/2004] Apparently, the NSA listens in on a phone call between al-Qaeda figure Khallad bin Attash and hijacker Khalid Almihdhar, who is staying at the hub. Attash mentions Almihdhar’s full name, as well as the first names of hijackers Nawaf Alhazmi and Salem Alhazmi. He says he wants the three of them to come to an important al-Qaeda summit in Malaysia in January 2000 (see January 5-8, 2000). The NSA has already heard the names of the three hijackers mentioned repeatedly in 1999 while monitoring the Yemen hub (see Early 1999). Apparently, US intelligence does not yet know bin Attash’s full name or role in al-Qaeda and won’t figure it out until late 2000 (see Early December 2000). [Wright, 2006, pp. 310] At the same time, US officials in Pakistan intercept Nawaf Alhazmi in Karachi calling Almihdhar at the Yemen hub. They learn Nawaf is planning a trip to Malaysia on January 4, 2000. The NSA is also monitoring Nawaf calling his brother Salem (the location of Salem at this time has not been revealed). [US Congress, 7/24/2003, pp. 143-144 ; Asia Times, 3/19/2004] The NSA will share details of these calls with the CIA and other agencies on December 29, 1999 (see December 29, 1999) and the CIA will eventually track Almihdhar to the Malaysia summit (see January 2-5, 2000). Abdulaziz Alomari and Ahmed Alnami are reported to become more religious after contact with the education system in Saudi Arabia (see 1999-2000). Sultan Bashiruddin Mahmood. [Source: BBC]Two retired Pakistani nuclear scientists create a charity to help the Taliban. The scientists, Sultan Bashiruddin Mahmood and Chaudiri Abdul Majeed, had both retired the year before after long and distinguished careers, and had both become radical Islamists. They set up a charity, Ummah Tameer-e-Nau (UTN), purporting to conduct relief work in Afghanistan, including helping to guide the Taliban on scientific matters. A number of pro-Taliban Pakistani generals and business leaders are on the board of directors, including Hamid Gul, a former director of the ISI. But not long after setting up an office in Kabul, the two scientists meet with Mullah Omar and Osama bin Laden, and discuss weapons development. During a later visit, Mahmood provides one of bin Laden’s associates with information on how to construct a nuclear weapon. [Frantz and Collins, 2007, pp. 264-265; Levy and Scott-Clark, 2007, pp. 310-311] The two scientists will have a more extensive meeting with bin Laden and Ayman al-Zawahiri in August 2001, and will discuss how al-Qaeda can make a radioactive weapon (see Mid-August 2001). Shortly before 9/11, the CIA will learn of this meeting (see Shortly Before September 11, 2001), and also learn that UTN offered to sell a nuclear weapon to Libya, but the CIA will take no effective action against the group (see Shortly Before September 11, 2001). In late 2001, the Wall Street Journal will report that “One Pakistani military analyst said it was inconceivable that a nuclear scientist would travel to Afghanistan without getting clearance from Pakistani officials and being debriefed each time. Pakistan maintains a strict watch on many of its nuclear scientists, using a special arm of the Army’s general headquarters to monitor them even after retirement.” Furthermore, a former ISI colonel says the ISI “was always aware of UTN’s activities and had encouraged Dr. Mahmoud’s Afghanistan trips. He said the ISI learned last year that Dr. Mahmoud had recently discussed nuclear matters with Mr. bin Laden, and Dr. Mahmoud agreed not to do so again.” [Wall Street Journal, 12/24/2001] The US will finally freeze UTN’s assets in December 2001 (see Early October-December 2001). Entity Tags: Pentagon, Digital Sandbox, Inc.
Bin Laden says in an interview, “I thank God that he has allowed my family to understand my path. They are praying for me.” [Der Spiegel (Hamburg), 6/6/2005] The Bin Laden family formally disowned Osama in 1994 (see Shortly After April 9, 1994), but some suggest that some of his relatives continue to support him. Russia’s President Vladimir Putin will later recall, “I talked with the [Clinton] administration and pointed out the bin Laden issue to them. I was surprised by their reaction. They wrung their hands so helplessly and said: ‘the Taliban are not turning him over, what can one do?’ I remember I was surprised: if they are not turning him over, one has to think and do something.” [Interfax, 9/21/2001; Guardian, 9/22/2001] This exchange, if true, must take place in 2000 because Putin becomes acting president of Russia on the first day of 2000 and President Bush replaces Clinton in the US in January 2001. The Washington Post will report in December 2000 that “The United States has quietly begun to align itself with those in the Russian government calling for military action against Afghanistan and has toyed with the idea of a new raid to wipe out Osama bin Laden (see December 19, 2000),” but no such raid takes place. A 1998 presidential directive gave the National Security Council authority to designate important upcoming events as National Special Security Events (NSSEs) (see May 22, 1998). The US Secret Service is in charge of planning and implementing security for NSSEs, and the FBI and FEMA also have major security roles. [CSO Magazine, 9/2004; Scripps Howard News Service, 1/11/2005] Louis Freeh, director of the FBI for much of the 1990s until June 2001, will later tell the 9/11 Commission that in the years 2000 and 2001, the subject of “planes as weapons” was always one of the considerations in the planning of security for “a series of these, as we call them, special events,” and “resources were actually designated to deal with that particular threat.” He confirms that “the use of airplanes, either packed with explosives or otherwise, in suicide missions” was “part of the planning” for NSSEs. [9/11 Commission, 4/13/2004] According to the Secret Service, “there is a tremendous amount of advance planning and coordination” for NSSEs, sometimes taking months or even years. 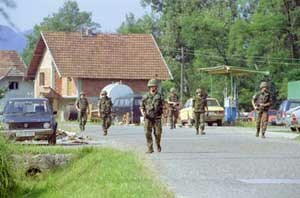 Various training initiatives are conducted, including “simulated attacks and medical emergencies, inter-agency tabletop exercises, and field exercises.” [United States Secret Service, 2002; US Congress, 7/9/2002] Presumably the use of airplanes in suicide missions is incorporated into some of these simulated attacks. Gulshair Shukrijumah’s mosque in Miramar, Florida. [Source: Fox News] (click image to enlarge)The Congressional Joint Inquiry will later find that several of the hijackers, including Mohamed Atta and Marwan Alshehhi, attend mosques in the US and that at least one of the mosques is in Florida. [US Congress, 7/24/2003, pp. 169 ] The Florida mosque attended by Atta and Alshehhi is the Al Hijrah mosque run by Gulshair Shukrijumah in Miramar, Broward County, Florida. Mohamed Atta and several other hijackers live near the mosque (see April 11, 2001) and train at nearby Opa-Locka airport (see December 29-31, 2000). After 9/11, the FBI will visit the mosque and ask Shukrijumah and his wife if they recognize the hijackers and if their son, Adnan, knew Atta or had mentioned trips to Pakistan and Afghanistan. [Miami New Times, 4/3/2003; Los Angeles Times, 9/3/2006] Atta is seen with Adnan Shukrijumah, a suspected al-Qaeda operative, in 2001 (see May 2, 2001). His father previously served as an imam at the Al Farouq mosque in Brooklyn. 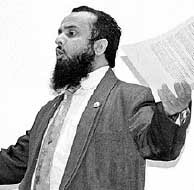 In addition to working as a translator for Sheikh Abdul-Rahman, he also testified as a character witness at the WTC bombing trial for one of the defendants, Clement Rodney Hampton-El, who attended Al Farouq. [FrontPage Magazine, 10/27/2003; Los Angeles Times, 9/3/2006] Gulshair Shukrijumah is receiving money from the Saudi embassy in Washington at this time. [Newsweek, 4/7/2003] In 2009, an FBI informant will claim that he tried to get close to both Atta and Adnan Shukrijumah at the Al Hijrah mosque in early 2001, but the FBI had him work on easier cases instead, because both of them were secretive and wary (see Early 2001). [ABC News, 9/10/2009] The army’s Able Danger data mining program identifies Atta as a member of an al-Qaeda cell centered on Brooklyn. Exactly how it does this is never disclosed, although Atta’s apparent association with Gulshair and Adnan Shukrijumah is one possibile explanation (see January-February 2000). National Security Adviser Sandy Berger will later say that in early 2000 the National Security Council (NSC), the US military, and the CIA develops a “new technique for detecting Bin Laden.” Berger calls it “very promising as a way of determining where he would be if we had one strand of human intelligence.” The Los Angeles Times will comment, “But whether the new technique was some sort of high-tech homing device or silent surveillance craft is a question left to future generations.” The next two and a half pages of the 9/11 Congressional Inquiry report discussing this technique are completely censored. [Los Angeles Times, 7/27/2003] Despite Berger’s implication that the US does not have human intelligence on bin Laden’s movements at this time, other accounts indicate that it does (see March-April 2001 and April 2001). Mohdar Abdullah. [Source: San Diego Union-Tribune]Mohdar Abdullah, a friend of future 9/11 hijackers Nawaf Alhazmi and Khalid Almihdhar when they live in San Diego, allegedly learns about the hijackers’ attack plans in early 2000. Abdullah helps Alhazmi and Almihdhar adjust to life in the US when they first arrive in San Diego. Abdullah speaks English well, and Alhazmi only speaks a little English and Almihdhar virtually none at all. Distantly Related to Almihdhar? - Abdullah is a Yemeni citizen, and after 9/11, it will be reported that the name in his Yemeni passport is actually Mohammed al-Mihdhar. Authorities don’t believe he is closely related to Khalid Almihdhar, but he could belong to the same tribe or clan. [San Diego Union-Tribune, 10/21/2001] There is evidence that Abdullah cases the Los Angeles airport in June 2000 with Alhazmi (see June 10, 2000), and he appears to know about the timing of the 9/11 attacks several weeks in advance (see Late August-September 10, 2001). 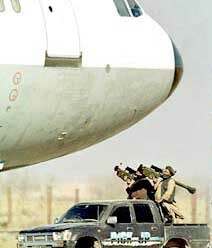 According to a French intelligence report, in the beginning of 2000 bin Laden meets with Taliban leaders, other al-Qaeda leaders, and armed groups from Chechnya to plan a hijacking, possibly of an airplane flying to the US. They create a list of seven possible airlines to hijack: American, Delta, Continental, United, Air France, Lufthansa, and a vague “US Aero.” The group considers hijacking a US airline flying out of Frankfurt and diverting it to Iran or Afghanistan or hijacking a French or German plane and diverting it to Tajikistan or Afghanistan. The goals are to increase international pressure to force a Russian withdrawal from Chechnya and to force the release of Islamists in US prisons. [Associated Press, 4/16/2007; Le Monde (Paris), 4/17/2007] This latter goal is a likely reference to the Sheikh Omar Abdul-Rahman, as US intelligence repeatedly hears of al-Qaeda hijacking plots to free him (see 1998, March-April 2001, and May 23, 2001). The Chechens are likely connected to Chechen leader Ibn Khattab, who has a long history of collaboration with bin Laden (see 1986-March 19, 2002 and Before April 13, 2001). 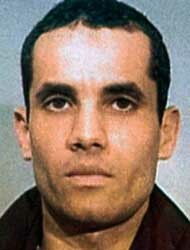 According to other news reports, in early 2000, the CIA observed Mohamed Atta as he bought large quantities of chemicals in Frankfurt, apparently to build explosives (see January-May 2000), and in February and March 2001, Atta and two associates will apply for a job with Lufthansa Airlines at the Frankfurt airport that would give them access to secure areas of the airport, but apparently none of them are able to get the job (see February 15, 2001). Bin Laden will apparently uphold the decision to go forward with this plot later in 2000 (see October 2000) and the French will continue to report on the plot in January 2001, apparently passing the information to the CIA (see January 5, 2001). But it is unclear what happens after that and if the plot morphs into the 9/11 attacks, is canceled, or was a ruse all along. Some of the 9/11 hijackers fought in Chechnya and therefore might also be linked to Ibn Khattab (see 1996-December 2000). Witnesses see Hanjour in San Diego with suspected Saudi agent Omar al-Bayoumi at least twice in early 2000 (see Early 2000). In 2000 through early 2001, Italian intelligence monitoring an al-Qaeda cell in Milan, Italy (see Early 2000-2001 and 2000-April 2001), hears operative Sami Ben Khemais citing instructions from London imam Abu Qatada. His comments include the statement: “Abu Qatada can convert anyone because he knows all religions, sects and philosophies. Abu Qatada has ordered all Muslims to spend their money on the cause of Allah, no matter how much money they have, thousands, millions, it’s not important. He says that money for God’s cause should be given to the mujaheddin, and not to the mosques.” [Canadian Broadcasting Corporation, 3/16/2004] Abu Qatada had been working as an informant for British intelligence but it is unknown when the relationship ends (see June 1996-February 1997). Abu Qatada’s apartment is raided in February 2001, but it is unknown if that is before or after these comments are recorded (see February 2001). 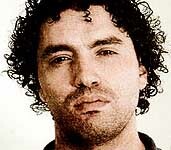 Ben Khemais is arrested in Italy in April 2001 (see 2000-April 2001). 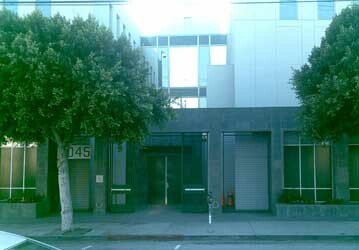 The Saudi Arabia Royal Consulate in Los Angeles. [Source: InfoUSA]According to Sen. Bob Graham (D-FL), co-chair of the 9/11 Congressional Inquiry, during this time Omar al-Bayoumi has an “unusually large number of telephone calls with Saudi government officials in both Los Angeles and Washington.” Graham will note this increased communication corresponds with the arrival of hijackers Nawaf Alhazmi and Khalid Almihdhar into al-Bayoumi’s life. He will see this as evidence of Saudi government involvement in the 9/11 plot. [Graham and Nussbaum, 2004, pp. 168-169] An FBI report obtained by the Intelwire.com website in 2008 will specify that from January through May 2000, al-Bayoumi calls the Saudi embassy in Washington 32 times, the Saudi Cultral Mission in Washington 37 times, and the Saudi consulate in Los Angeles 24 times. [Federal Bureau of Investigation, 4/15/2002 ] Al-Bayoumi is in contact with Fahad al Thumairy during this time, and the two call each other’s private phone numbers many times (see December 1998-December 2000). 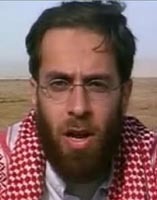 Al Thumairy is an official at the Saudi consulate in Los Angeles and a known Islamic radical (see January 15-February 2000). 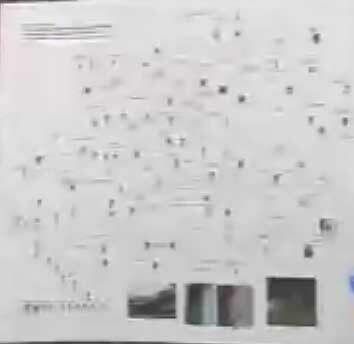 A blurry photograph of a 2005 reconstruction of the pre-9/11 Able Danger chart showing Mohamed Atta and others. [Source: C-SPAN]A US Army intelligence program called Able Danger identifies five al-Qaeda terrorist cells; one of them has connections to Brooklyn, New York and will become informally known as the “Brooklyn” cell by the Able Danger team. This cell includes 9/11 hijacker leader Mohamed Atta, and three other 9/11 hijackers: Marwan Alshehhi, Khalid Almihdhar, and Nawaf Alhazmi. According to a former intelligence officer who claims he worked closely with Able Danger, the link to Brooklyn is not based upon any firm evidence, but computer analysis that established patterns in links between the four men. “[T]he software put them all together in Brooklyn.” [New York Times, 8/9/2005; Washington Times, 8/22/2005; Fox News, 8/23/2005; Government Security News, 9/2005] However, that does not necessarily imply them being physically present in Brooklyn. 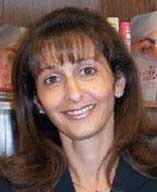 A lawyer later representing members of Able Danger states, “At no time did Able Danger identify Mohamed Atta as being physically present in the United States.” Furthermore, “No information obtained at the time would have led anyone to believe criminal activity had taken place or that any specific terrorist activities were being planned.” [CNN, 9/21/2005; US Congress, 9/21/2005] James D. Smith, a contractor working with the unit, discovers Mohamed Atta’s link to al-Qaeda. 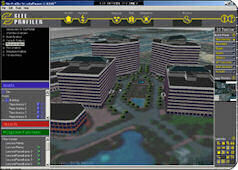 [WTOP Radio 103.5 (Washington), 9/1/2005] Smith has been using advanced computer software and analysing individuals who are going between mosques. He has made a link between Mohamed Atta and Sheikh Omar Abdul-Rahman, ringleader of the 1993 bombing of the World Trade Center. [Fox News, 8/28/2005; Government Security News, 9/2005] Atta is said to have some unspecified connection to the Al Farouq mosque in Brooklyn, a hotbed of anti-American sentiment once frequented by Abdul-Rahman, which also contained the notorious Al-Kifah Refugee Center. [Times Herald (Norristown), 9/22/2005] Smith obtained Atta’s name and photograph through a private researcher in California who was paid to gather the information from contacts in the Middle East. [New York Times, 8/22/2005] Lt. Col. Anthony Shaffer claims the photo is not the well-known menacing Florida driver’s license photo of Atta. “This is an older, more grainy photo we had of him. It was not the best picture in the world.” It is said to contain several names or aliases for Atta underneath it. [Jerry Doyle Show, 9/20/2005; Chicago Tribune, 9/28/2005] LIWA analysts supporting Able Danger make a chart, which Shaffer describes in a radio interview as, “A chart probably about a 2x3 which had essentially five clusters around the center point which was bin Laden and his leadership.” [Savage Nation, 9/16/2005] The 9/11 Commission later claims that Atta only enters the United States for the first time several months later, in June 2000 (see June 3, 2000). [9/11 Commission, 7/24/2004, pp. 224] However, investigations in the months after 9/11 find that Mohamed Atta and another of the hijackers rented rooms in Brooklyn around this time (see Spring 2000). Other newspaper accounts have the CIA monitoring Atta starting in January 2000, while he is living in Germany (see January-May 2000). Atta, Alshehhi, Almihdhar, Alhazmi and other hijackers have connections to associates of Sheikh Abdul-Rahman (see Early 2000-September 10, 2001). The US and Germany miss an opportunity to uncover the 9/11 plot through the arrest of Mohamedou Ould Slahi, an al-Qaeda operative tied to millennium attacks and the Hamburg al-Qaeda cell. Slahi lived in Duisburg, Germany for most of the 1990s and apparently US and German intelligence began monitoring him there around the start of 1999 due to his communications with his cousin, al-Qaeda leader Mahfouz Walad Al-Walid. In 1999 he had repeated contact with members of the Hamburg al-Qaeda cell and helped some of the 9/11 hijackers travel to Afghanistan. US investigators will later allege he also advised one militant to “travel to the United States to take part in the planned [9/11] attacks” (see 1999). 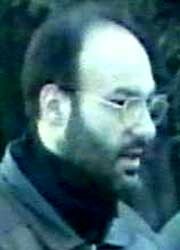 In November 1999, Slahi moves to Canada and is seen with associates of Ahmed Ressam, who is planning to bomb the Los Angeles airport. US officials will later believe that Slahi went to Canada to activate Ressam’s cell. [Los Angeles Times, 4/24/2006] After Ressam is arrested in mid-December 1999 (see December 14, 1999), Slahi is monitored closely. 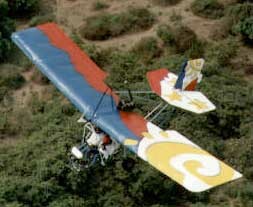 He is arrested in Senegal after flying there in mid-January 2000. Transfered to his home country of Mauritania, he is interrogated by FBI officials. [New York Times, 1/29/2000; Agence France-Presse, 2/20/2000; Los Angeles Times, 4/24/2006] In early February 2000, Newsweek will report, “The key link in the chain connecting bin Laden to Ahmed Ressam—and an alleged New Year’s bomb plot in the United States—may be Mohamedou Ould Slahi.” [Newsweek, 2/7/2000] However, despite these suspicions, he is released later in February. He moves back to Germany, and is arrested and held there in April 2000 for three weeks, and then released again. He quickly returns to Mauritania. He will be arrested again shortly after 9/11. [Agence France-Presse, 2/20/2000; US Department of Defense, 4/20/2006, pp. 184-216] Despite all this interest in Slahi, his connections to the 9/11 plot and some of the 9/11 hijackers in Hamburg are apparently not made until after 9/11. He will later be sent to Guantanamo where he is reportedly subjected to harsh interrogation (see September 27, 2001). Two future 9/11 hijackers, Khalid Almihdhar and Nawaf Alhazmi, are given the contact of someone useful in the US, and they may utilize this contact when they move to the US a short time later. Dhiren Barot is a British citizen who was born in India, and by early 2000 he has been involved with Islamist militants for several years. For instance, he fought with militants in Kashmir and was an instructor at an Afghan training camp. According to a footnote in a 9/11 Commission report, Barot is sent to Malaysia with al-Qaeda leader Khallad bin Attash on the orders of 9/11 mastermind Khalid Shaikh Mohammed (KSM). Bin Attash attends an al-Qaeda summit in Kuala Lumpur that is also attended by Amihdhar and Alhazmi (see January 5-8, 2000). Barot apparently does not attend the summit, but shortly afterwards he meets with al-Qaeda leader Hambali, who does attend the summit, and he gives him two addresses. According to the 9/11 Commission, one of the addresses is in the US, “possibly in California,” and the other address is in South Africa. He tells Hambali that he could “contact people in those locations” if he “needed help.” Hambali will later be captured and will deny to interrogators that he ever passed the addresses on to anyone else. But Newsweek will later report, “US officials are dubious about Hambali’s denials and suspect that the unspecified US address in California may well have been passed along to [Almihdhar and Alhazmi].” [Newsweek, 8/16/2004] These two hijackers fly to Los Angeles, California, only about a week after the summit, and begin living in San Diego (see January 15, 2000). Presumably, the US address would point to at least one conspirator in the 9/11 plot living in the US, but if the name of this person is known to investigators, it is not made public. 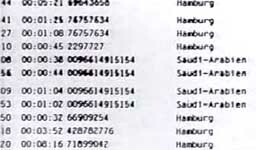 A phone bill of one of the 9/11 hijackers. More details are unknown. [Source: Canadian Broadcasting Corporation]While living in the US, the 9/11 hijackers make at least 206 international phone calls. In 2006, these calls will be mentioned in a German intelligence report based on telephone records obtained from the FBI. There are 66 calls to Syria, 32 calls to Saudi Arabia, and 29 calls to Germany. A majority of the call are made from a cell phone registered to hijacker Marwan Alshehhi. Additional details on who was called, who else made the calls, when the calls were made, what other countries were called, etc… have not been made public. The Chicago Tribune will later note that the calls to Germany are not surprising since Alshehhi and some others were living there, but “the hijackers’ connections to Saudi Arabia and Syria are far from fully explained.” [Chicago Tribune, 3/8/2006] It is unknown when these calls were discovered, but reports suggest at least some of the hijackers’ international calls were being monitored by US intelligence as they were made (see Summer 2001, September 10, 2001, and Early 2000-Summer 2001). US intelligence is aware from monitored phone calls that Nawaf Alhazmi is travelling to an important al-Qaeda summit in Malaysia (see January 5-8, 2000). 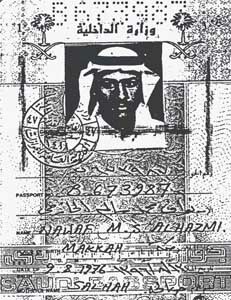 Alhazmi is known to be in Karachi, Pakistan, with a ticket to Malaysia for January 2, 2000. CIA and Pakistani officials plan to have his passport scrutinized as he passes through the airport, but he changes his ticket departure date twice. Officials get confused and are not there when he leaves the country, so they still don’t learn his last name. [Stern, 8/13/2003] The 9/11 Commission later notes that “officials could have worked on logical flight itineraries and perhaps realized that Nawaf could and probably did keep to his original plan.” But not only is this not done at the time, apparently the flight manifests are not checked after the fact to see in anyone with the name Nawaf had boarded. [9/11 Commission, 1/26/2004, pp. 6 ] Even after being monitored for several days in Malaysia, US intelligence supposedly still will not learn his last name (see January 5-8, 2000 and Shortly After). 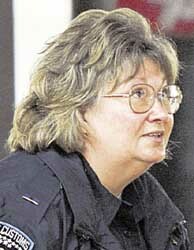 Mary Deborah Doran. [Source: Havecamerawilltravel.com]Al-Qaeda operative Khallad bin Attash possibly flies to the US around this time. In 2011, former FBI agent Ali Soufan will write in a book that in late 2003, he and some other FBI officials plus some CIA officials briefed the 9/11 Commission about al-Qaeda. 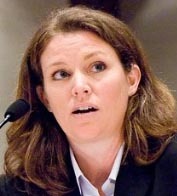 In the course of that briefing, an FBI official named Mary Deborah Doran said, “[W]e found that Salah bin Saeed bin Yousef—this is the alias Khallad [bin Attash] traveled under—was listed as having traveled to LAX [Los Angeles Airport] during the millennium.” A CIA analyst present denies that bin Attash ever went to the US. Doran replied, “You may be right, but if he wasn’t there, why is his alias on the flight manifest?” Apparently, the CIA analyst has no response to this. [Soufan, 2011, pp. 303] This is all that is publicly known, since even though this information is presented to the 9/11 Commission, the Commission never even mentions bin Attash going to the US as a possibility in its final report. When Exactly Could This Occur? - If bin Attash does go to Los Angeles, it is unclear exactly when this takes place. 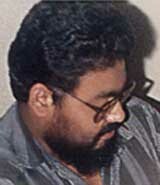 Bin Attash appears to be busy in Malaysia for most of late December 1999, recovering from surgery there (see Mid-December 1999). Then he makes a series of test flights from Kuala Lumpur to Bangkok to Hong Kong and back from December 31, 1999 to January 2, 2000 (see December 31, 1999-January 2, 2000). One logical possibility is that he continues these test flights to the US and back from January 2 to 5, returning to Malaysia in time for the al-Qaeda summit he attends there from January 5 to 8 (see January 5-8, 2000). After the summit, it is known he goes to Bangkok, Thailand, and stays there until he flies to Karachi, Pakistan, on January 20 (see January 8, 2000 and January 20, 2000). But it is also possible he could fly to Los Angeles and back during his time in Thailand, since many of his days there are not accounted for. Future 9/11 hijackers Nawaf Alhazmi and Khallad Almihdhar attend the Malaysia summit with bin Attash and then fly to Los Angeles on January 15 (see January 15, 2000) and start living in California, so it could be that bin Attash goes to Los Angeles to prepare the way for the two hijackers, or to help them start living there. If He Goes to the US, Does the CIA Know? - Since the CIA knows bin Attash is using the Salah bin Saeed bin Yousef alias for all his plane flights around this time, and flies with Alhazmi and Almihdhar to Thailand using this alias on January 8, and Alhazmi and Almihdhar fly to Los Angeles one week later, it would be logical for the agency to check if bin Attash ever goes to the US under that name as well. But it is unknown if the CIA checks for this information before 9/11.